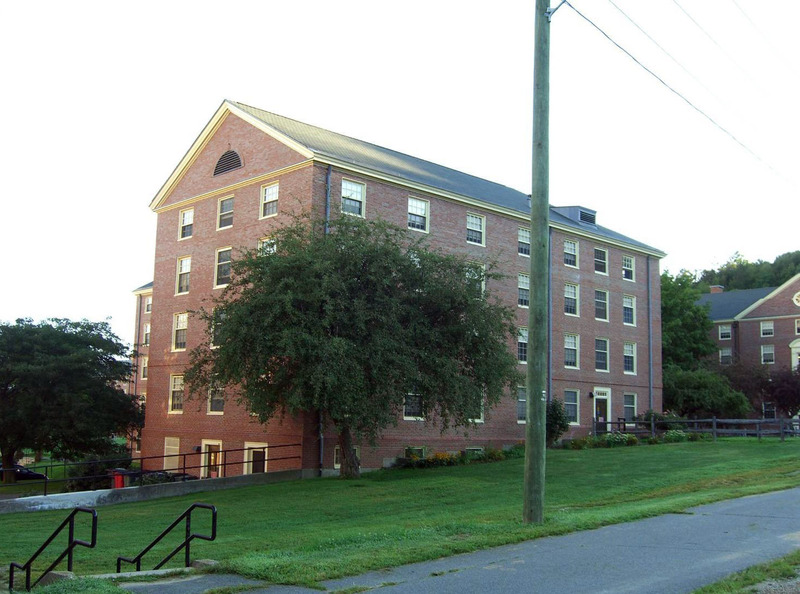 Crabtree House is an approximately 33,000 square foot residential building on the Amherst campus of the University of Massachusetts, one of ten structures comprising the Northeast Residential Area. In 1953 Crabtree House and Leach House were added to the Northeast Residential Area, forming the beginnings of the north and south sides of the complex. Later buildings completed the east and west sides of the complex consistent with the existing spatial organization. In 1954, Arnold House completed the western edge of the area. A 1959 campus plan shows the complex complete, with a large parking area to the east of Arnold House in place. A 1969 oblique aerial photograph confirms the location of the parking area. A sand volleyball court has been added to the area to the east of the parking area. Although a new addition, the volleyball court does not impact the open character of the space, which is defined by a strong east-west axis of open lawn. Historic photographs do not show vegetation associated with Crabtree House or Leach House. All vegetation at the houses, consisting primarily of trees over lawn and shrubs at the buildings’ foundations, are new additions from the time the buildings were constructed. The L-shaped building is 4-stories with a basement level accessible to grade at the rear (west) elevation. The south wing is 7 bays wide by 3 bays deep with a gable roof. The north wing is 8 wings wide by 3 bays deep and also has a gable roof that forms a hip at the building’s southeast corner. The main building entrance occurs at the 3 central bays of the north wing’s east elevation. These bays project from the façade and are distinguished by a cross gable. This elevation also includes a 2-story wing with flat roof that serves as an accessible terrace. The terrace is bounded by a wrought-iron railing. The common-bond brick pattern is used throughout all elevations. A molded-brick water table defines the basement level and a brick beltcourse occurs at the second floor level. All windows are wood, as well as the cornice defining the roofline and the gable peaks. The façade includes a window pattern of primarily double-hung sash. The exposed basement through third floor levels of the building have 8/12 double-hung sash. The fourth floor has 8/8 sash. At the attic level, the gable ends are framed as pediments and contain demilunes openings which were originally windows though some have been replaced by aluminum grilles. The openings are framed with brick arches and keys. Original copper flashing at the eaves and copper downspouts with collector heads have been lost. The main building entrance features a wood doorcase with Ionic columns and entablature. The double wood doors have divided lights and a fixed transom. Above the entablature, the second floor bay has a pedimented window case. Named for the popular actress, comedian, and supporter of the University, Charlotte Mignon “Lotta” Crabtree (1847-1924). From the Massachusetts Historical Commission, UMass Amherst Building Survey reports (2009). For additional information, consult the University Archives (RG 36/101).